Hey there! Yes, I’m still here. I couldn’t wait for August #TwelveLoaves and an excuse to make these ridiculously delicious cheddar swirl breakfast buns! I have 1000’s of photos I’d love to share here and posts even ready to go (how could that possibly be true?) and why haven’t I just posted something…any thing? I have been busy with summer and the kids. Some travel and an incredible conference. The incredible conference was the first ever Food and Wine Conference thrown by my friend Isabel from #SundaySupper. I even got to meet our friend Renee from #TwelveLoaves…hi, Renee! (I know you’ll read this tomorrow). It was so cool to meet you and everyone! Yes, I often talk to my friends in my blog posts…hehehe So, anyway. Where was I? Oh, yes! Summer. It’s slipped by too fast. Really, it has. We have been braving the heat and enjoying some last no schedule days at the beach. Today was a fun one. 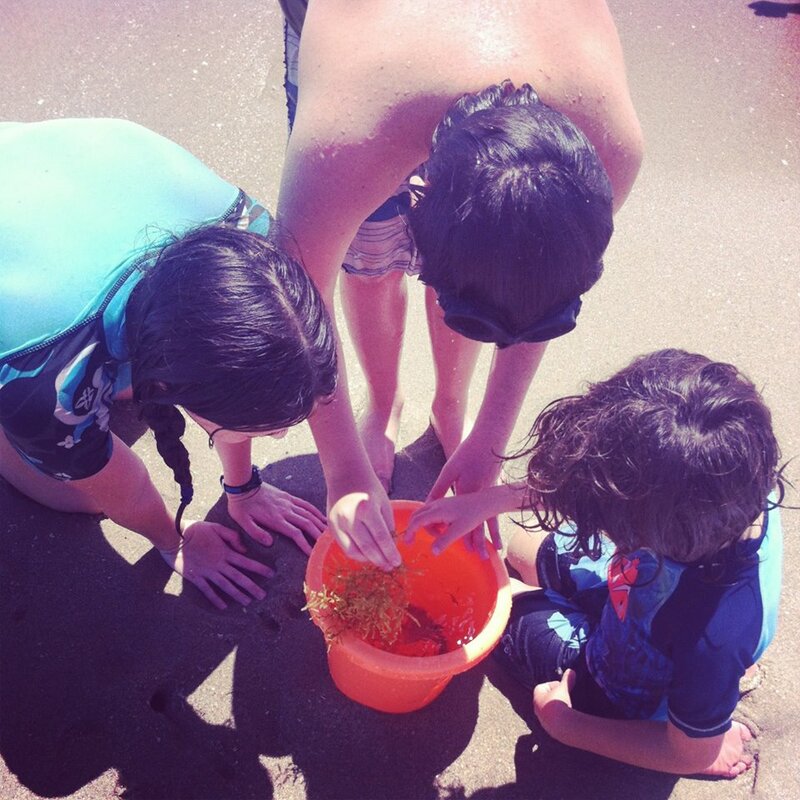 Our neighbor was teaching the kids how to find the baby shrimp, crabs and fish hiding in the seaweed. We released them soon after…too hot in that little bucket! 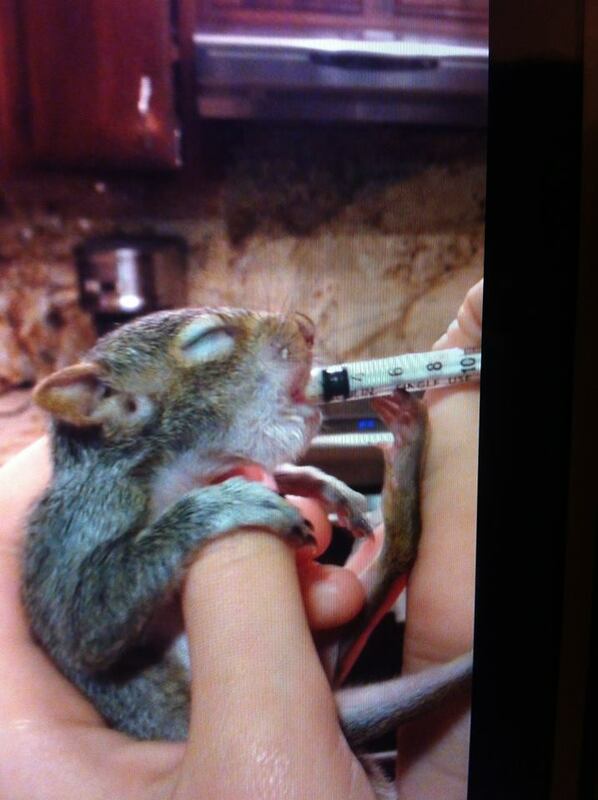 My neighbor’s are raising a baby squirrel! Yes, a tiny little squirrel. I happened to find one that fell out of our tree last week while they were out of town. Their daughter wanted to raise it so badly. The poor little bugger had spinal injuries and did not make it. How nice was it a week later when a client of our neighbor (he’s a veterinarian)called and said they found a baby squirrel that fell out of their tree. Say hello to Puddles! Personally, I’m not into squirmy critters with sharp nails. But right now, he’s awfully cute! There were so many happy, happy moments that happened so far this summer. Of course the highlight of the summer was our family trip to Italy. It’s wonderful to spend time together with my family and with my in-laws that I don’t get to see very often. And the food…oh, the food. Where do I begin? We even got to go to my father’s hometown in Sicily. 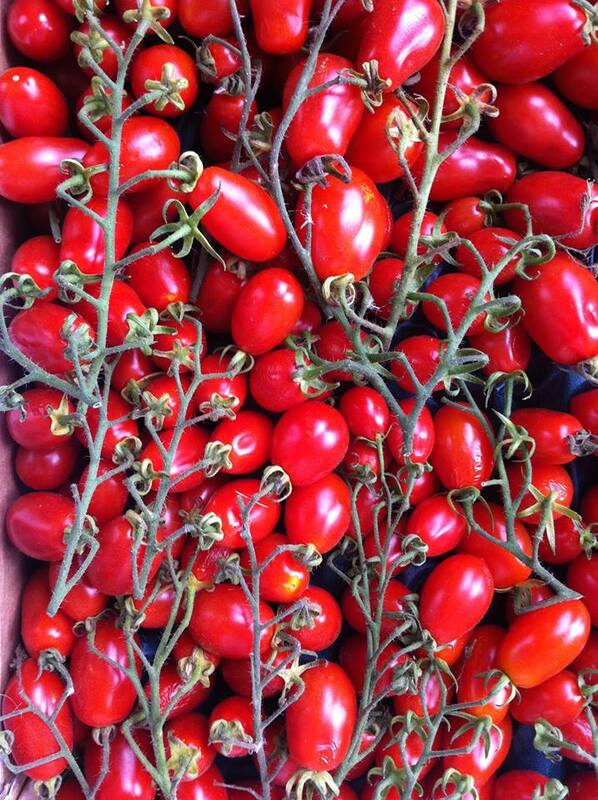 Here’s a glimpse of Sicily’s incredible cherry tomatoes. It’s been hard to get back into the groove of blogging again. It takes me forever and a day to put a post together. I know I’ve talked about this before. But when there is something as special as a #TwelveLoaves post coming up, I finally get kicked in the bottom with a little motivation! I found these fantastic cheddar swirl rolls in Deb‘s Smitten Kitchen Cookbook. I used my dough recipe that I use I think in almost every sweet bread recipe. It was just perfect even in a savory recipe. Deb mentions in the recipe you can switch the cheese to provolone. If you don’t have dill on hand, use some parsley. I happened to have both and stuck with cheddar cheese because I do love it so! I stuck to Deb’s filling suggestion and am thinking that next time, provolone will be my cheese of choice! #TwelveLoaves August: Savory. After a gorgeous month of July stone fruit breads, our August baking mission is taking on a savory side. Think breads with cheeses and spices. Garlic and onion, oh my! What savory mood are you in? 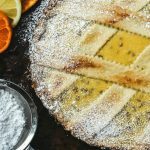 Share your favorite savory bread recipe (yeast or quick bread). Let’s get baking! 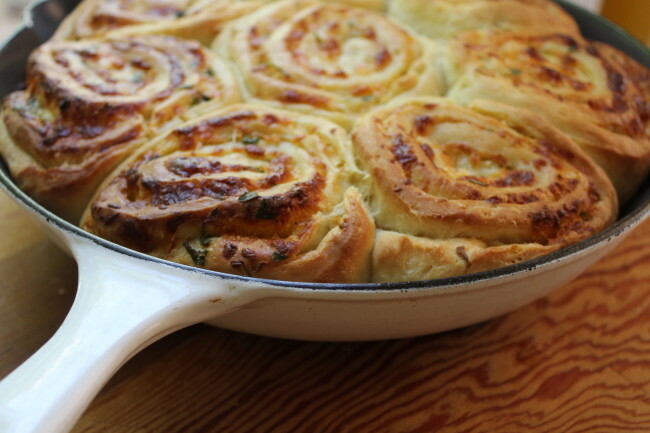 Delicious savory bread happening at our baker’s blogs…run and see what’s been baking! Yes, yes! Cheese is my nemesis. How about yours? I’ve been going a little crazy with tomato season. Tomatoes in every thing and I think I will be canning some next week along with some mangos. Yay, for my mango tree finally coming around! Normally I don’t feature my hands/fingers in photos. My daughter has been practicing her photo taking skills all summer. She took almost every photo you see here today (except for the 1st two shots). I need to get her to photograph some future posts soon before it’s back to school time! These rolls are fantastic for breakfast. Imagine them baking in the morning and the smell of the cheese and the herbs…the onion. Delicious! 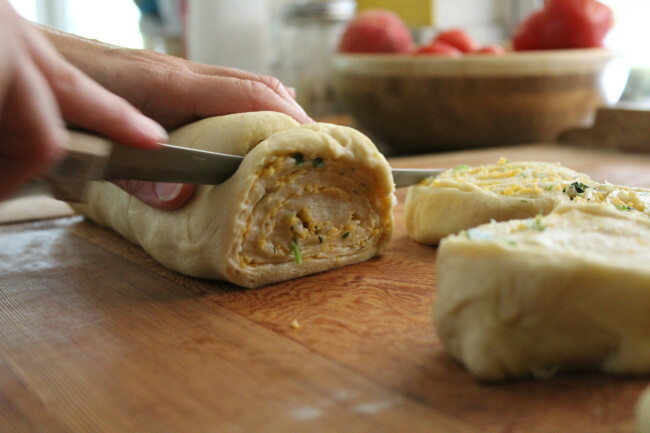 A really fun dinner roll idea. I think they are the sort of roll you could eat at any time of day! Heat the milk in a small saucepan over medium heat until it just begins to boil. Remove from heat and let stand until cooled to room temperature. Meanwhile, sprinkle the yeast over the warm water in a large bowl. Add 1 T of the sugar and let stand until foamy, about 5 minutes. Beat in the remaining 2 T sugar, eggs and butter. Beat in cooled milk. Gradually add the flour and salt, scraping down side of bowl, until a soft dough forms. Turn dough onto a floured work surface and knead the remaining flour into the dough, adding more flour if too sticky. Knead for about 10 minutes until smooth. The dough will be soft. Grease a large bowl. Place the dough in the bowl. Cover with plastic wrap and place in a warm spot until doubled in size, about 1 1/2 hours. In a small bowl, stir together all of the ingredients for the filling. Coat two 9-inch round baking pans with nonstick cooking spray. Line bottoms with parchment paper; coat paper with spray. Punch down the dough. Dump the dough out onto a floured surface, roll out the dough into a 10-by-18-inch rectangle. 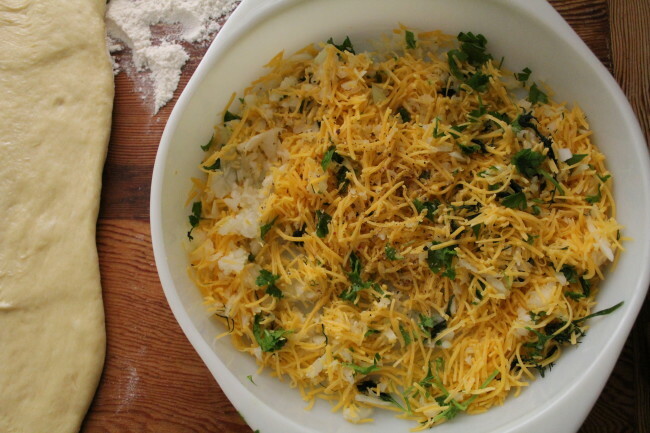 Spread the cheddar mixture over the dough, leaving a 1-inch border on the sides. Brush the borders with water. Tightly roll the dough into an 18-inch log, rolling toward the clean border; pinch the seam to seal. Cut crosswise into 12 generous 1 1/2 inch pieces. Arrange 6 pieces in each prepared pan. Brush the rolls with the remaining melted butter. Cover with plastic wrap and let sit in a warm spot until buns double in size, about 30 to 45 minutes. Uncover pans and bake buns until they are golden-brown and bubbly, 30 to 40 minutes. Oh my goodness these buns look incredible!! SO delicious and love the flavorings. Hows that little baby squirrel doing?? Gorgeous buns Lora! It was so nice to meet you in person at the conference. I'm still dreaming about your husband's wonderful cod dish for lunch. Now I'll be dreaming about these buns too. Yum! Your trips to Italy every summer make me jealous…how I adore that country! 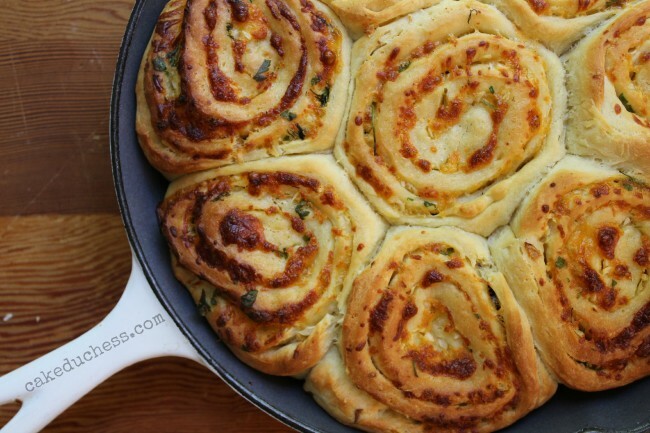 These savory rolls come close Lora! I think I like savory rolls more than sweet ones, especially with a good cheese. They look amazing. 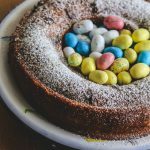 I can´t wait to add my recipe next week. ooh! These look amazing and this is such a great idea! P.S. I'm not sure how I feel about the baby squirrel either, but the poor little guy is really cute 😉 And he fell out of a tree! How sad is that! (it feels so weird not to be a part of Twelves Loaves this month!) Sounds like you and the kids had a fabulous summer!!! I would love to go to Italy. . and Sicily! I love that you got your daughter to take some of these photos. . she did great!!! and these cheddar swirl breakfast buns. . oh my gawd, they look sooooo good! I think I remember seeing these in Deb's cookbook. . I will have to try your recipe soon! 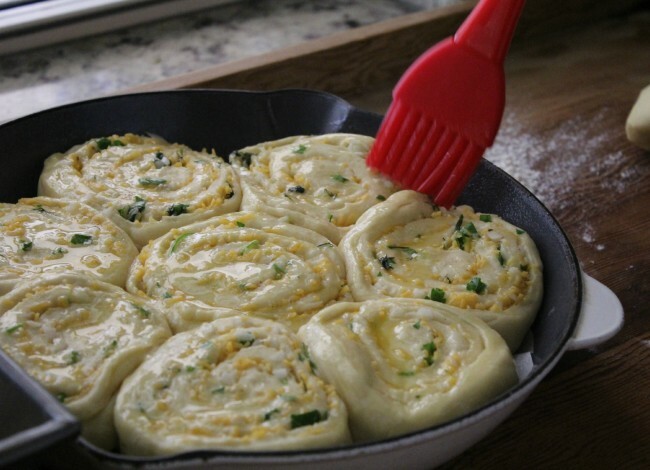 These buns look so delicious, love the cheddar and fresh herbs! These rolls are lovely! 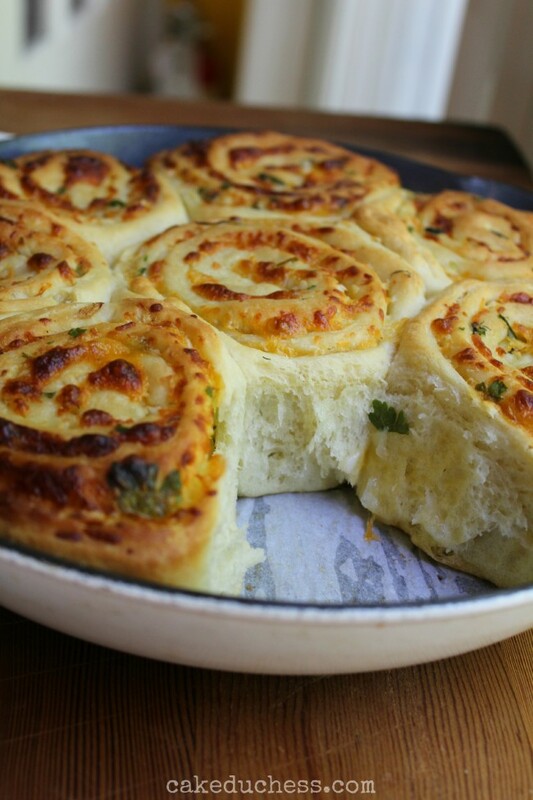 I adore savory, cheesy breads so these are really calling my name. 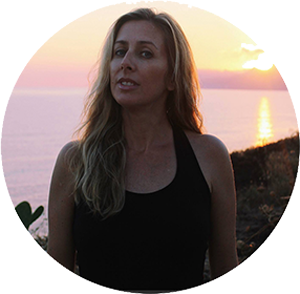 I have the opposite problem… I'm totally in the groove of blogging but I don't have enough time to do all the projects I'd like to participate in. I miss doing Twelve Loaves!! I'm up to my eyeballs between contributor posts as well as my own but I really need to jump back in here one month soon. I love a good savory bread so perhaps I can find the time this month. 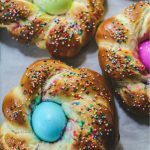 These lovely buns as well as all your breads are an inspiration. Lora, those buns look soooo good, and tell your daughter she did an amazing job with the photographs! Beautiful tomatoes too! What beautiful breakfast buns! I love to think of your daughter helping with photographs and your family being in the kitchen together– what special time to spend together. I agree, the summer has gone too quickly but it sounds like you fit a lot in! Sounds like a wonderful summer with your family, I've loved your Italy pictures! These buns look seriously delicious and addicting. Your buns looks gorgeous! Love the filling! I've linked a cheese bread! I want one (plus one plus one etc.etc.) of your buns. They look delicious and summarise perfectly your busy summer. I am totally drooling over here… promise me next time I come to W. Palm that we can spend time in the kitchen baking these… I am a terrible baker. Your daughter is amazingly talented already. I love that she is working with you. There is nothing quite like it. Mine just went back to college but we will continue to work together. Thank you so much for being such a big part of Food and Wine Conference. You are truly a very special person. Tell Fabrizio that I am still totally craving his Cod Recipe! It was out of this world. Lora, these cheddar rolls look amazing! I also love cooking my rolls in cast iron. Can't wait to see the theme for September! Your rolls look delicious. I'm a little late with my submission but thanks for letting me participate. Holy shizz, Lora, what I wouldn't give for a giant pan of your breakfast buns right now. Cheese and carbs are my weakness (hmmm…ok, I have a lot of weaknesses but this combination is definitely one of them). It sounds like you've had an incredible summer so far. I loved all your photos from Italy on Instagram. These rolls sound scrumptious! I love fresh herbs in home baked bread. Yum! 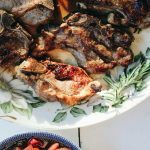 I've yet to post my #TwelveLoaves recipe for August. I found 3 baby squirrels that fell about 20 ft from a nest. They were only a few days old, 2 were dead 1 was alive. Probably something happened to mom. I wrapped it in a handkerchief, laid him in a small Kleenex box on top of a Ziploc bag of warm water and a rice filled sock, also heated in the microwave. Then took it to a rehabilitator. He was warm and not dehydrated so stands a good chance of surviving. It's tempting to keep them because they are cute but it's actually illegal to keep wildlife such as birds, ducks, squirrels etc. A rehaber is licensed to give medical attention and to prepare them to be released back into the wild where they belong. Great to see people looking out for animals. Thank you! Your cheddar rolls look totally delicious, all puffy and bursting with flavor, but the photo of Puddles stole the show. Is he still cute and helpless?